2014 wasn’t the hottest year ever on land. That’s terrifying. It’s getting hotter out there. 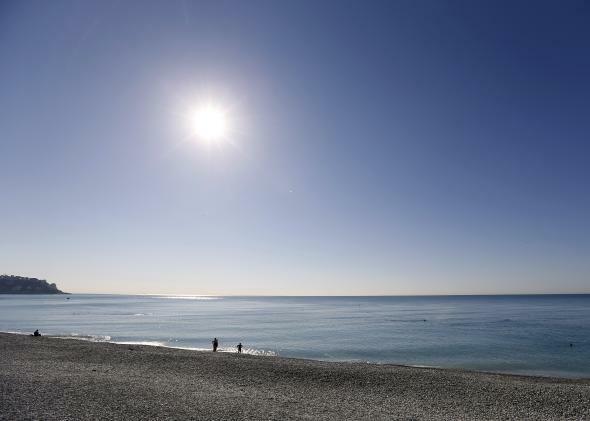 There was big news on Friday: Earth’s temperature reached new heights last year, according to the National Oceanic and Atmospheric Administration and NASA. Averaged over the entire planet, that means 2014 was likely the hottest year in the history of human civilization. But on land, where everyone lives, there wasn’t a new record. Global land temperatures ranked only fourth hottest, next to 2005, 2010, and 2007. Instead, 2014’s extreme heat was almost entirely on the backs of the global oceans, which beat 2003 and 1998 by a relatively wide margin. The fact that the oceans—and not the land—were so warm last year should deeply worry us. 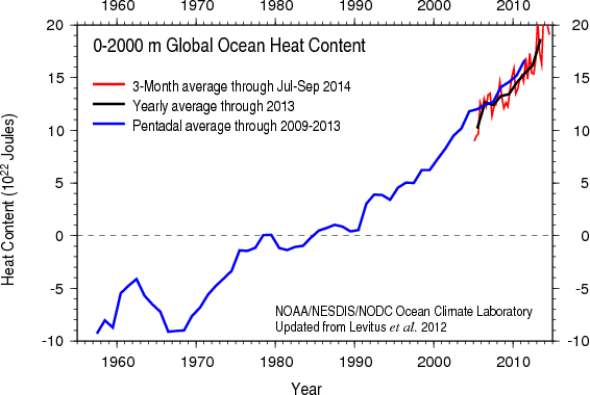 Record ocean heat in 2014 will help lock in new temperature records for years to come. Plus, we live on a water planet, after all, and the oceans drive the global climate in a way that the continents can’t. Abnormally warm ocean temperatures are regularly linked to extreme weather events, like nor’easters, rapidly intensifying hurricanes, and the incredibly intense recent rainfalls in places like Pensacola, Florida; Long Island, New York; and Phoenix. All this means it’s much less likely that this year’s global heat record was a one-off fluke—and that the extra ocean heat is probably here to stay. The rate of sea-level rise is “far worse than previously thought,” according to a new study. In addition to melting glaciers and ice sheets, the rising temperature of the ocean is a big driver of sea-level rise, as warm water has a greater volume than cold water, by weight. There’s fresh and convincing evidence that ocean life is facing a mass extinction. Though the extent of the changes humans are imparting on the planet are vast, it’s the rate of change that’s most alarming. A separate study released last week showed that critical tipping points in Earth’s life support system are increasingly being crossed. As a result species are going extinct at a rate 100 times faster than has occurred historically. “It’s kind of like you’ve stepped off the curb. You’re not going to get hit by a car immediately, but there is danger,” Steve Carpenter, a professor of zoology at the University of Wisconsin–Madison, told Vice. Humans sometimes tend to forget that we’re just another species on the planet, and our livelihood depends on a planet capable of supporting a rich diversity of life. When you couple 2014’s record-setting oceans with our ever-increasing greenhouse gas emissions, it portends an ominous surge of heat globally—on both land and in the oceans—for years to come.